First frosts and scent of tangerines are the first signs that winter has come. And the first day of the coldest season is not only the coming holidays happiness. December 1 is the time when a unique online service for fast data import, File2Cart has been launched. So, we would like to celebrate 3rd birthday together with our lovely clients. On such occasion we present a possibility to perform an automated data import with 50% off. You can enjoy this special offer until January 1, 2015. Don’t miss a unique opportunity to use File2Cart service to import data from CSV/XML/TXT/XLS/XLSX to your shopping cart. Over 40+ most powerful solution are supported by our service. Notice: special cannot be used for a purchase of Suppоrt Service Packages. Hence, step forth to convenience and celebrate with File2Cart! File2Cart is 3! 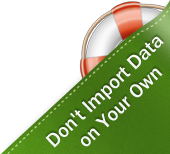 Get a gift performing an automated data import with 50% off till January 1, 2015.